Fresh Trak Foods is based in East Granby, CT and has been producing Salsa Loca since 2005. Our products are now available in several locations across CT and MA. Salsa Loca can also be purchased online, and at the events we attend. The business is currently owned and operated by Bob Kane. We are very conscientious about quality and the environment. A must for our salsa -Use only fresh ingredients, locally grown produce (when possible), and make it in small batches to ensure consistent quality and flavor. Our 12-oz. retail containers are made entirely from corn plastic, making them biodegradable and compostable! (When ordered online, Salsa Loca is available in 16 and 32 oz. recyclable containers.) 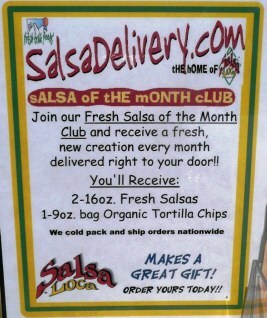 Also, SalsaDelivery.com is hosted on servers 100% powered by wind energy! We are proud to be GREEN!